The engine is linked directly to the clutch, fixed between the engine and gearbox. Two manufacturers, AP racing and Sachs produce Carbon/Carbon F1 clutches which must be able to tolerate temperatures as high as 500 degrees. The clutch is elctro-hydraulically operated and can weigh as little as 1,5 kg. They are multi-plate designs that are designed to give enhanced engine pick-up and the lightweight deigns mean that they have low inertia, allowing faster gear changes. The drivers do not manually use the clutch apart from moving off from standstill, and when changing up the gears, they simply press a lever behind the wheel to move to the next ratio. The on-board computer automatically cuts the engine, depresses the clutch and switches ratios in the blink of an eye. The picture shows the range of clutches produced by AP Racing. The clutches on the left are designed for road based racing or rally cars, whilst those on the right are the ones used in F1 cars, and are only 100 mm in diameter. F1 car gearboxes are different to road car gearboxes in that they are semi-automatic and have no synchromesh. They are sequential which means they operate much like a motorcycle gearbox, with the gears being changed by a rotating barrel with selector forks around it. The lack of a synchromesh means that the engine electronics must synchronise the speed of the engine with the speed of the gearbox internals before engaging a gear. Each team builds their own gearbox either independently or in partnership with companies such as X-trac. The regulations state that the cars must have at least 4 and no more than 7 forward gears as well as a reverse gear. Most cars have 6 forward gears, although there is the start of a trend towards using seven. Seven speeds are used if an engine has a narrow power band, having more ratios in the gearbox keeps the engine working in this ideal band. The gearbox is attached to the back of the engine via four or six high-strength studs, with both the engine and gearbox being fully stressed members of the car. The suspension for the rear wheels bolts directly onto the gearbox casing, carrying the full weight of the rear of the car. As a result, the gearbox must be very strong, and so it is normally made from fully-stressed magnesium. In 1998, Stewart and Arrows produced gearbox casings made from carbon-fibre. This helped weight distribution but caused many problems related to heat and the forces imposed by the suspension arms. Minardi were the first team to fabricate their gearbox out of titanium in 2000, having advantages of a 5 kg decrease in mass when compared with forged magnesium. Ferrari have followed suit, using fabricated titanium parts in the gearbox of the 2001 car. The 2000 Minardi gearbox produced by CRP Technology is shown above left. 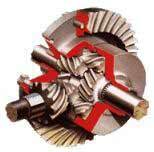 Gear cogs or ratios are used only for one race, and are replaced regularly during the weekend to prevent failure, as they are subjected to very high degrees of stress. The gear ratios are an important part of the set-up process of the car for each individual track. The teams will adjust the final gear (sixth or seventh depending on how many gears their gearbox have) so that the car will just be approaching the rev limit at the end of the straight. (For the race it will be a few revs less than the limit to allow for the revs to rise in the slipstream of another car.) Next, the lowest gear needed on the track will be adjusted to give the best acceleration out of that corner, then the other gears will be chosen so that they are spaced out equally between the two pre-determined gears. Each gear change is controlled by a computer, taking between 20-40 milliseconds. The gearbox is built to enable the mechanics to easily change the ratios, as they can even be dependent on the wind direction. It takes about 40 minutes for the six ratios to be changed in the pits. To enable the rear wheels to rotate at different speeds around a corner, F1 cars use differentials much like any other forms of motorised vehicle. Formula One cars use limited-slip differentials to help maximise the traction out of corners, compared to open differentials used in most family cars. The open differential theoretically delivers equal torque to both drive wheels at all times, whereas a limited slip device uses friction to change the torque relationship between the drive wheels. Electro-hydraulic devices are used in F1 to constantly change the torque acting on both of the drive wheels at different stages in a corner. This torque relationship can be varied to 'steer' the car through corners, or prevent the inside rear wheel from spinning under harsh acceleration out of a bend. The FIA allows the use of these devices provided that their characteristics are fixed once the car is out on the track. A Moog valve will constantly adjust the friction between the two shafts around the track to maximise the performance of the car dependent on what characteristics have been entered into the on-board computer. The Moog valve opens and closes depending on what the software is telling it to do, but the valve must work to the same set of conditions that are pre-programmed whilst the car is in the pits. This means that the driver cannot actually alter the characteristics of the differential due to a change in tracks conditions for instance, which was allowed in the days of the many driver aids around 1993.